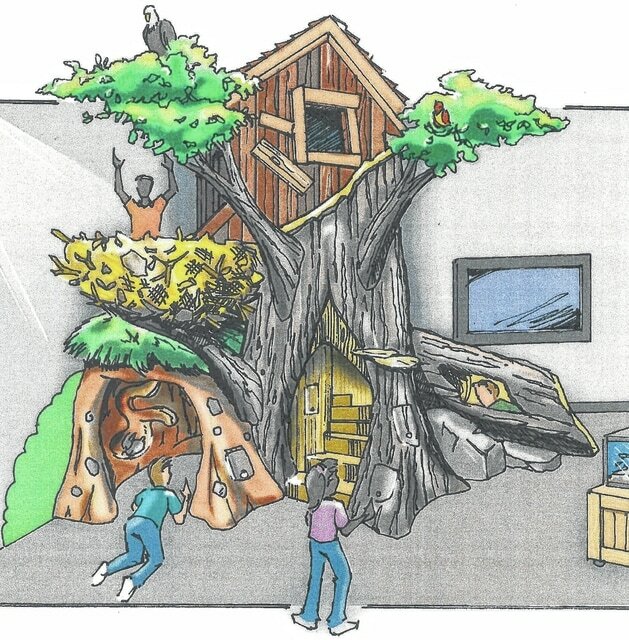 The Crawford Park District Interactive Tree Project is moving forward with its plan is a large display renovation at Lowe-Volk Park Nature Center and it includes plans for an indoor children’s treehouse learning center. Splashmakers LLC, a Mansfield-based company that specializes in recreational attractions, has designed the exhibit, which will stand more than 16 feet tall. The estimated cost of the exhibit is $50,000, Fisher said. “The exhibit is being built in pieces that are small enough to go through our front door.” he said, “It is much more then a playscape, concept wise it isn’t just a play area, it’s a learning center. This is definitely be a draw for nature education, kids will be surprised and excited about the learning experiences they will have. The kid-friendly play area with a variety of hands-on displays, park officials said. Children will be able to crawl through the root system of the tree, climb inside the trunk, view an eagle’s nest in the canopy and read tree-themed books in the club house at the top. The treehouse will feature a spiral staircase, an eagle’s nest, soil/root habitat cave, hollow log learning tunnel and interactive panels. The goal of the project is to energize and engage children in active nature education. Fisher said $41,928 was donated for the project. The Galion Building & Loan Bank “Billy Buck’s Kids Club” donated $1,000 to the center for the project. Martha Kozik, a volunteer for the Nature Center, contacted Don Barr, president of Galion Building and Loan Bank to see if the bank would be interested in donating to the treehouse project. Citizens interested in helping to complete the financing for the tree house project should contact the park. Any donations can be mailed to the park or dropped off at the Nature Center. Evans can be reached at 419-468-1117 ext. 2049.